How do you provide great customer service? Start with a great customer database! 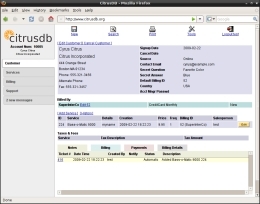 CitrusDB is open source customer service and billing software. It is used by many different service providers, including internet service, subscriptions, consulting, and telecommunications. citrusdb requires PHP 5.2 and recommends MySQL 5 or later. Licensed under GPL version 2. General information and history about each customer is linked to their records. New customers can be imported from an online form or entered by a customer service representative. Unlimited services can be assigned to one customer. Services can have as many custom fields as needed to store all the information and attributes for that service. Each service can have unique billing criteria. Stores general billing information and necessary information about the customer's billing cycle. Can bill on any billing cycle needed, one-time, monthly, bi-monthly, quarterly, 6 months, yearly, etc. Billing is able to provide batch credit card exports, print or email invoices. Each customer has support notes related to them shown with their customer record. Notes can be sent to individuals or to specific groups of users. Every service activation or de-activation generates notes to create a record of what occured. The online account manager allows customers to view their account services and recent balance and payments. It also allows them to submit support notes to their account via the online form.